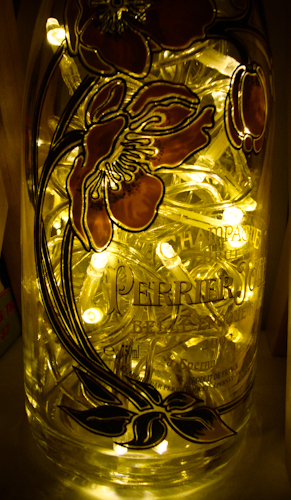 After 3 years in the wine cupboard, I finally had a reason good enough to open the prettiest bottle of champagne ever. And it was definitely worth the wait. But what to do with the bottle? Hand painted with Japanese anemones, designed by Emile Gallé, the creator of the Art Nouveau movement, in 1902, this is one bottle that’s not destined for the recycling bin. 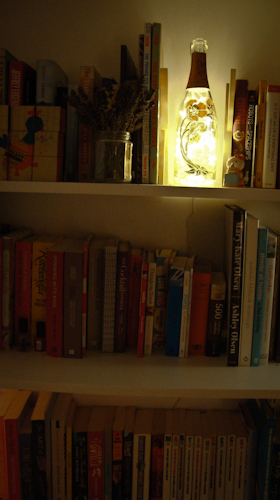 Instead, filled with clear-corded fairy lights, it’s the perfect addition to the book shelf. But perhaps I need another bottle so I can make bookends? I wonder if anyone would like to buy me more? What a fab idea ! !